This freezes beautifully, just omit the cheese. You can leave it out altogether or stir some grated parm into the pesto once it has thawed again. 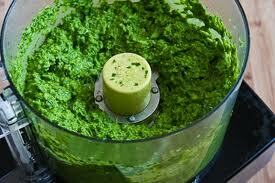 Pulse garlic scapes, oil, parmesan, and nuts in a food processor until finely chopped; season with salt and pepper.